Space shuttle Endeavour, seen here in 2008 atop NASA's Boeing 747 carrier aircraft, will arrive in Los Angeles on Sept. 2012, for delivery to the California Science Center. LOS ANGELES — Space shuttle Endeavour's final flight plan — and road trip map — were revealed on Wednesday (Aug. 8), previewing the cross-country, and cross-county, routes the retired NASA orbiter will follow before landing at the California Science Center for display. Endeavour, the youngest of NASA's shuttles, having been built after the 1986 space shuttle Challenger tragedy, flew 25 space missions between 1992 and 2011. Next month, it will embark on "Mission 26," which will (tentatively) span 26 days, to travel from Florida to the Los Angeles museum. "We are calling it 'The Big Endeavour,'" Jeffrey Rudolph, the president of the California Science Center (CSC), told collectSPACE.com. "It is pretty exciting and yet a challenging task. We've a lot of things to do to make sure everything works, but we're ready to go." Endeavour will spend two weeks at the Los Angeles airport, housed in a hangar on loan from United Airlines. On Oct. 12, it will leave on a 2-day, 12-mile road trip atop a NASA wheeled transporter. Described by the mayor of Los Angeles as the "mother of all parades," the slow but steady procession through the streets of L.A. and Inglewood will feature a 'half time' show produced by famed actress Debbie Allen. Rolling up in the early evening hours of Saturday, Oct. 13, the five-story tall, 78-foot wide (24 meters), 170,000-pound (77,111 kilogram) winged spacecraft will enter the CSC's newly-erected Samuel Oschin Space Shuttle Endeavour Display Pavilion. The building, which was named after the late philanthropist whose foundation made a significant gift to exhibit Endeavour, will open to the public on Oct. 30. 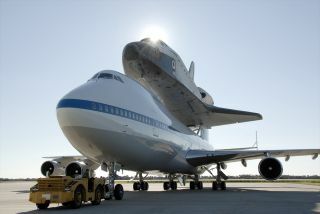 Endeavour's ferry flight atop NASA's jumbo jet will proceed similarly to the earlier deliveries of space shuttle Discovery to the Smithsonian in Washington, D.C. and the prototype orbiter Enterprise that was flown to the Intrepid Sea, Air and Space Museum in New York City. In both earlier cases, the shuttle made spectacular flyovers of the cities' metropolitan areas and landmarks before touching down. "It is a week to ten days of work to prepare the orbiter, getting it de-mated, taking off the tail cone, and doing the miscellaneous other work we need for transport," Rudolph told collectSPACE.com. "And then we'll hopefully have a little extra [time] there, as we have built in a cushion. So if any weather issues delay the ferry flight in Florida or anywhere across the country on the way, our contingency for that is extra time at LAX." Moving the shuttle from the city hall to the CSC, which is located south of downtown L.A. in historic Exposition Park, will take the entire day. Continue reading at collectSPACE.com about what awaits visitors inside the California Science Center’s new Samuel Oschin Space Shuttle Endeavour Display Pavilion and to see the road map for the spacecraft’s delivery from LAX airport to the science center.